Today was a bit bitter-sweet The weather was down right perfect for a long bike ride today. 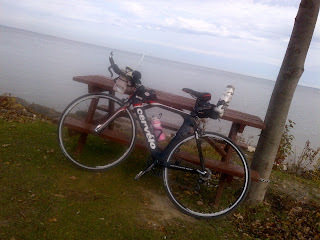 Of course I'm in taper so my "long" ride was just under 4 hours - but enough time to ride up Lake Simcoe one last time. Last week I told the nice old man at the Lakeside Convenience Store that I wouldn't see him again until spring. He was happily surprised when I rolled up today to grab a bottle of water. He said the weather was sure to be nice again next week and that he would be sure that he would see me again. I explained that sadly, no, I would not be riding up again this year. He wished me luck and sent me on my way. I enjoyed my ride today, soaking in the beautiful fall colours and warm sunshine. I've been so lucky to have such great weather this year to train in. I can't wait until spring and I can ride up there again! 11 days and 6 hours to Ironman Florida! I'm off to the pool!